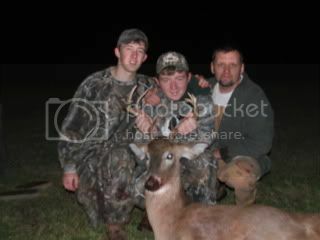 Taylor took this buck bow hunting. 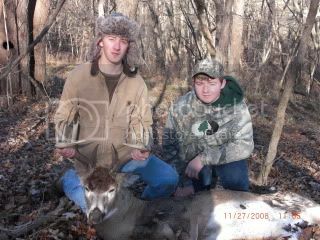 I love to see kids getting outdoors bow hunting. I received a call back in November from my friend Brad who told me about a giant Missouri buck that had been harvested by a fifteen year old boy with a bow. A friend of his Shawn at work had called him and told him about it. Brad asked me if I would like to go over and see the buck and do a story about it on here. I told him I would love to do a story on it. So the next day my son and I drove over and got to meet Taylor and his family and they were kind enough to let me take some video footage of the Pope and Young buck and do a story on here. The boys name is Taylor and him and his brother Tayden woke up a little late that day but got up and went out and sat on a log together and had been using a doe bleat when this monster buck showed up. Taylor made a great shot and harvested a beautiful once in a lifetime buck bow hunting. I unofficially scored the buck around 185 gross and 175 net. To harvest a Pope and Young buck of this caliber at fifteen is just awesome. Now I don’t know but I would like to see where Taylor’s buck ranks all-time of whitetails taken by a fifteen year old with a bow. I would think it would rank very well. Just a few days after Taylor harvested his buck with his brother Tayden watching, it was Tayden’s turn bow hunting and he took a nice eight point buck. Way to go Taylor and Tayden it looks like the future of deer hunting is in good hands. Sometimes I think us hunters tend to complicate deer hunting to much with all the products and gadgets and everything and if we would just keep it simple we would probably see more bucks. I guess it comes down to being at the right place at the right time. Congratulations to Taylor and Tayden on such a great story. I’m sure it is a hunt that you two as brothers will cherish and remember for a very long time. Being in the great outdoors making memories like this with family and friends is something that we should fight to keep and be able to pass on the great American heritage of hunting to our kids and theirs. There are many people out there who want to take away our privilege to hunt. We can do more to help protect wildlife and it’s habitat and it starts with us being good stewards of the land and being responsible ethical hunters. Awesome story guys thank you for letting me share it here. 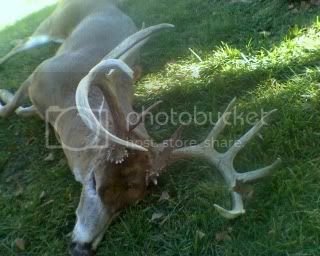 To contact Deerhuntingbigbucks.com with questions or comments click DHBB contact form. Tagged bow hunting, giant Missouri buck. Bookmark the permalink. I’m the Director of Marketing for Trophy Room. Trophy Room is a premier online destination for the world’s most serious hunting and fishing enthusiasts. Trophy Room provides superior video content highlighting real-life experiences from outdoorsmen all over the world – all for free. Check it out for yourself. Here’s a link to one of our Big Game Hunting videos – http://trophyroom.com/video/adZZ3MopY5/. If you like what you see, please consider adding a link to Trophy Room on your site. Please don’t hesitate to embed this video or any others on http://deerhuntingbigbucks.com. We would love to hear any feedback from you and your readers. Also, let me know if you are looking for video content to accompany any new or existing content on your site. We are happy to send you footage to embed with your content or give advice on creating new videos. Lastly, we would love to have more members like you on the site – so if you have hunting or fishing videos of your own, feel free to upload them at Trophy Room! Trophy Room is a free and targeted venue to promote your blog. I have to say, I enjoy reading this website. Could let me know how I can subscribing with it? By the way I stumbled upon your blog through Google. Hunting with family members is what it’s all about. If people who don’t like hunting were more aware of this kind of hunting we’d sure be better off.